I need to unfold my sheet metal model; however, there are gaps between the plates (as shown in the attached image). What is the best way to fill these gaps and then determine a 2D sketch which I may use to assemble the model. For more clarity, I'm attempting to make a model in CAD, then unfold it so that I may cut wood boards and and assemble them to make what is represented in the CAD model. Your image didn't come through. 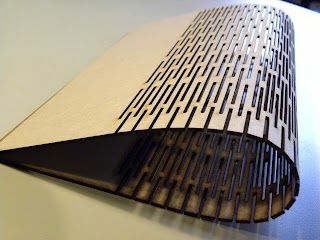 Is this a laser-cut thin sheet of wood veneer with a "grid" of slits that allows the wood to flex? Like the image (found at random) below? If so, I doubt Inventor can unfold it for you with the slits in the folded model.